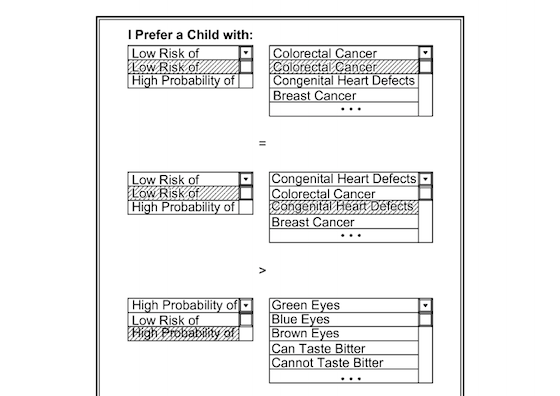 http://cdn0.sbnation.com/assets/3327119/screen.png Thanks to personal genomics companies like #23andMe, it’s becoming quicker and easier for us to find out who we are. But will the same technology one day allow us to decide who our babies will be — before they’re even born? That’s the question raised by a newly issued #patent, which grants 23andMe rights to a system that allows parents to pick and choose their children’s traits prior to undergoing fertility treatment. Brazil's WIPO Proposal on Patent Limitations and Exceptions -- well-argued proposal for balanced IP law. We-to-Me Participation (Nina Simon) -- useful mental framework for thinking about social software and online experiences, both from the point of view of a cultural institution and for any online activity. Stage one provides people with access to the content that they seek. Stage two provides an opportunity for inquiry and for visitors to take action and ask questions. Stage three lets people see where their interests and actions fit in the wider community of visitors to the institution. Stage four helps visitors connect with particular people—staff members and other visitors—who share their content and activity interests. Stage five makes the entire institution feel like a social place, full of potentially interesting, challenging, enriching encounters with other people. Tldr -- an application for navigating through large-scale online discussions. The application visualizes structures and patterns within ongoing conversations to let the user browse to content of most interest. In addition to visual overviews, it also incorporates features such as thread summarization, non-linear navigation, multi-dimensional filtering, and various other features that improve the experience of participating in large-discussions. City Senses -- Chris Heathcote points out that Pachube can be used as a sensor for the world, not just for energy. His pilot projects are good, and I'd like to see more. The biggest change I'm predicting for the next 10 years is the rise of sensor networks: smart stuff, aware environments, and loquacious locations.